Amarnath is located at 145 km east of Srinagar in Kashmir. Amarnath is an ice Silva-linga that changes size with all the seasons of the year and also as the moon waxes and wanes it becomes bigger and smaller. Angrabadi temple is about 56 km from Ranchi in Jharkhand. It is a temple complex in Khunti. The temple complex houses temples of Lord Ganesh, Ram-Sita, Hanuman and Shiva. Arunachaleswara Temple which is located in Tiruvannamalai is dedicated to Lord Siva and it is one of the largest temples in India . Arunachaleswara temple is one among the "Panch Boodha Sthalams" and it is "Agni" Sthalam. It has also the significance as "Padal Petra Sthalam". Augurnath temple is located at Meerut in the Northern Indian state of Uttar Pradesh. 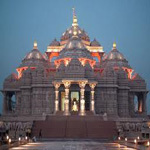 The temple is little-known place of worship but of great historical importance all over the northern India. The temple of majestic Babulnath is located in the very heart of Mumbai City, at nearly 1000 feet above sea level which is over looking the Arabian Sea which is dedicated to Lord Shiva.